Looking for a quick dinner recipe that your friends and family will enjoy? This chicken has a touch of sweetness that is sure to please with ease. These chicken breast get a touch of sweetness with a touch of brown sugar. Serve with white rice (or brown) and your favorite sides for a great dinner that doesn’t require a lot of kitchen time! Bake uncovered for 15 to 30 minutes. Didn’t I still you it was easy! This dish would go great along side Garlicky Baked French Fries! CPK taste right in your own kitchen! Position racks in the upper third and middle of the oven. Place an inverted baking sheet on the top rack and preheat the oven to the appropriate temperature according to your pizza crust. Mix 2 tablespoons barbecue sauce and 1 teaspoon olive oil in a small bowl. Put the chicken in a baking dish, season with salt and pepper and brush with the barbecue sauce mixture. Bake on the middle oven rack until cooked through, about 20 minutes. Let cool, then cut into 1/2-inch cubes. Cover the crust with with the remaining 1/3 cup barbecue sauce, leaving a 3/4-inch border. 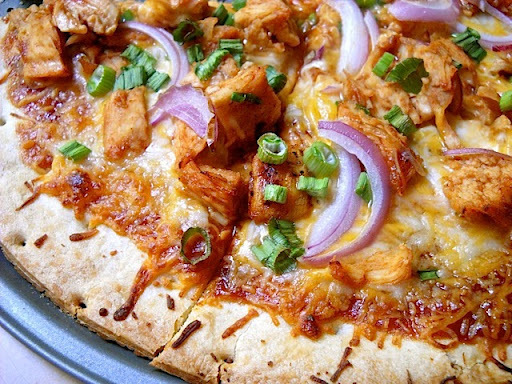 Top with the chicken, mozzarella and red onion. Slide the pizza (on the parchment) onto a pizza peel or another inverted baking sheet, then slide onto the baking sheet; bake until the cheese melts and the crust is golden, 20 to 25 minutes. Sprinkle with cilantro. That’s right. 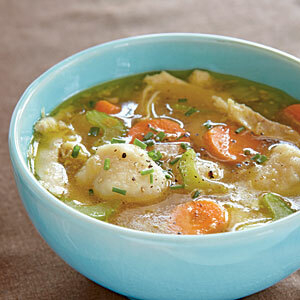 We CAN have chicken and dumplings and it be gluten free! YES! Betty Crocker Gluten Free Bisquick makes it happen! In 3-quart saucepan, heat chicken broth, chicken, vegetables, salt, and pepper to boiling. In small bowl, mix 1 cup milk and the cornstarch with wire whisk until smooth; stir into chicken mixture. Heat just to boiling. In small bowl, stir dumpling ingredients with fork until blended. Gently drop dough by 8 rounded spoonfuls onto boiling chicken mixture. Cook uncovered over low heat 10 minutes. Cover and cook 15 minutes longer. Happy New Year! Wow. 2012. New Year. Instead of making a new year’s resolution this year, I decided to keep doing what I have been doing. Eating healthy and keeping myself happy. Without your health, you can’t do all the things you want to do. Health is key! I will continue to post delicious recipes and delectable desserts that are good for you! Gluten free, dairy free but definitely not taste free! Let’s start it off right! Chicken is delicious. 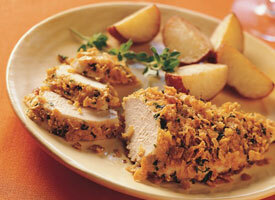 Chicken with a crunch is even more delicious! This recipe uses Rice Chex as the crunchy coating! 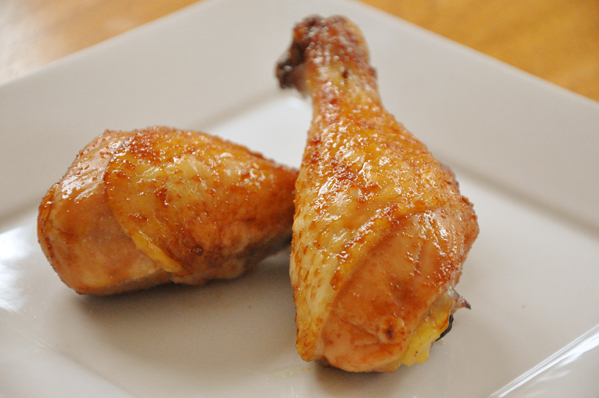 6 boneless skinless chicken breasts (about 1 3/4 lb) – You can also use skinless drumsticks. Heat oven to 425°F. Spray 13×9-inch pan with cooking spray. In shallow dish, mix 2 tablespoons of the buttery spread, the rice milk, chives, salt, black pepper, and garlic powder. In another shallow dish, mix crushed cereal, parsley and paprika. Dip chicken into rice milk mixture, then coat lightly and evenly with cereal mixture. Place in pan. Drizzle with remaining 2 tablespoons buttery spread. Bake uncovered 20 to 25 minutes or until juice of chicken is clear when center of thickest part is cut (170°F). How about a side of rosemary roasted potatoes? This recipe is great and also works GREAT with sweet potatoes! We have this as a side a lot at my house! 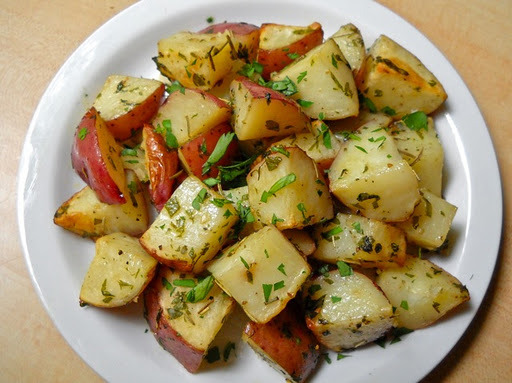 Cut the potatoes in half or quarters and place in a bowl with the olive oil, salt, pepper, garlic and rosemary; toss until the potatoes are well coated. Dump the potatoes on a baking sheet and spread out into 1 layer; roast in the oven for at least 1 hour, or until browned and crisp. Flip twice with a spatula during cooking to ensure even browning. For this new year what about a joyful cookie to ring in the new year right?! It’s like eating an almond joy candy bar in a cookie form! YUM! Chocolate, coconuts and almonds OH MY! Heat oven to 375°F. In large bowl, stir cookie mix, butter, extract and egg until soft dough forms. Stir in 1/2 cup of the coconut and the almonds; mix well. Roll dough into 36 (1-inch) balls. Dough will be sticky. 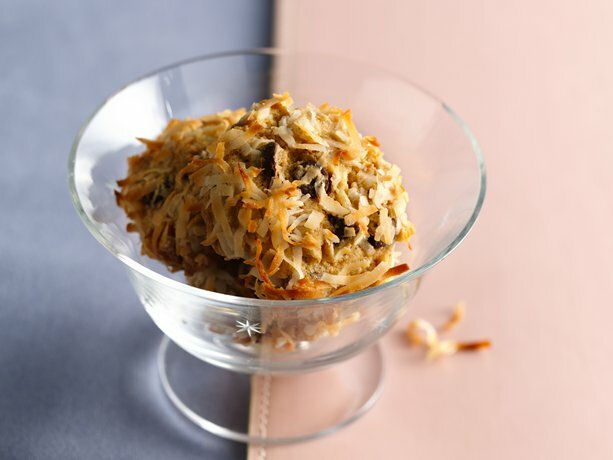 Roll balls in remaining coconut until well coated. Place 2 inches apart on ungreased cookie sheets. Bake 9 to 11 minutes or until light golden brown. Cool 2 minutes; remove from cookie sheets to wire rack. Cool completely. Store covered at room temperature. Cooking tip: if you don’t have toasted almonds, heat oven to 350°F. Spread almonds in ungreased shallow pan. Bake 6 to 10 minutes, stirring occasionally, until light brown. It’s New Years Eve! Ok so you’ve got some party ideas from my last post. Here a few more! Like I said, you got to ring in the new year BIG! Heat gas or charcoal grill. (Or if you are inside, get a grill pan) In small bowl, mix all ingredients except chicken; brush mixture over chicken. Place chicken, bone sides down, on grill over medium heat. Cover grill; cook 15 to 20 minutes. Turn chicken. Cover grill; cook 20 to 40 minutes longer, turning 2 or 3 times, until juice of chicken is clear when thickest part is cut to bone (180°F). Serve with white rice or your favorite side. Of course, we HAVE to do another cocktail cupcake! How about a lemon drop cupcake! 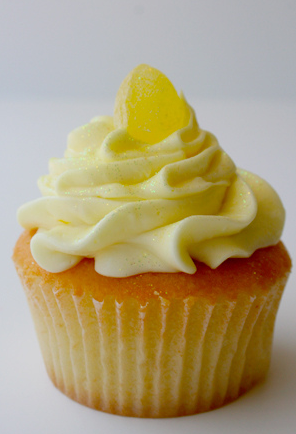 A big ball is going to drop and while your counting down into the new year, toast with a lemon drop cupcake. In a mixing bowl, cream buttery spread and sugar. Beat in eggs, one at a time. For frosting, cream butter and sugar in a small mixing bowl. Add lemon juice, vanilla, lemon peel and rice milk; beat until smooth. Fill and ziplock plastic bag with the frosting and cut the tip of the bag. Frost cupcakes. 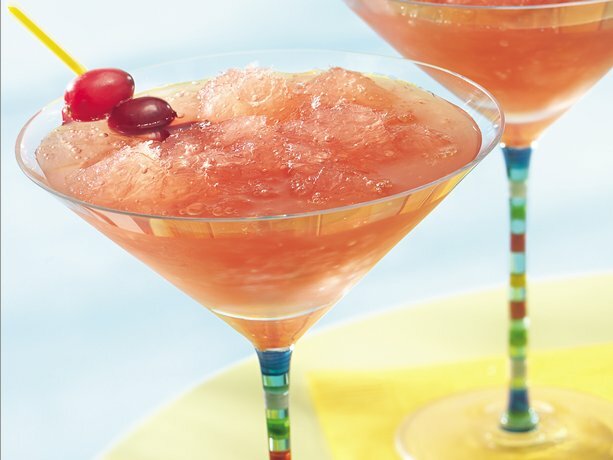 Last but definitely not least a Cosmo slush!! In 13×9-inch glass baking dish, stir limeade mixture and cranberry juice until well mixed. THAT’S IT! Celebrate, be merry and ring in the new year with those you love! ENJOY! I am all about flavor. Sweet, spicy, savory I like a lot of flavor. Dinner is a perfect time of day to inject some flavor in your day. Chicken is a perfect empty canvas just waiting for flavor to be painted on. 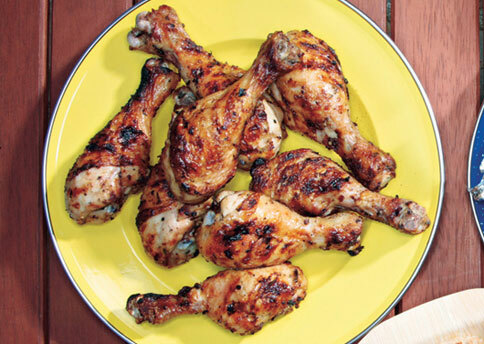 Here is a great recipe that uses a zesty and robust rub to bring life into chicken breast. Preheat the oven to 375°F. Line a shallow baking pan with aluminum foil. Lightly grease the foil so that the chicken does not stick. Set aside. In small bowl, mix chili powder, brown sugar, lime peel, salt, garlic powder and ground red pepper. Rub both sides of chicken with oil, then with spice mixture. Refrigerate the “rubbed” chicken 20 to 30 minutes before baking (this really enhances the flavor). Place the chicken in the prepared pan and bake for 25 to 30 minutes or until the juice of the chicken is clear when the thickest part is cut. 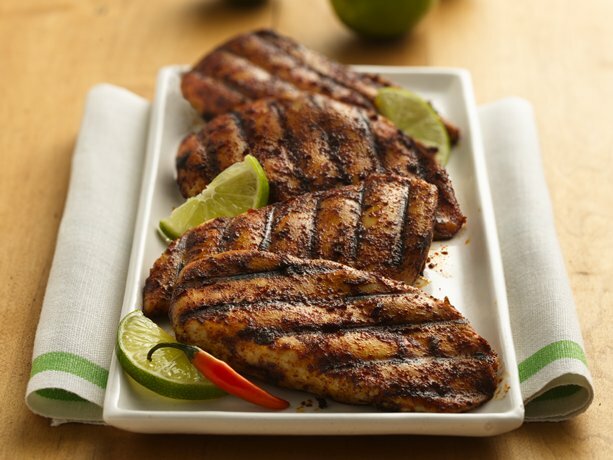 This recipe makes me think of the fiesta lime chicken that they have at Applebee’s and what would great with this chicken? A margarita! 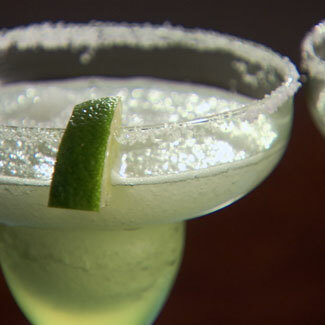 Here is a classic margarita recipe. Fill blender with crushed ice. Pour in limeade concentrate, tequila and triple sec. Blend until smooth. If desired, rub rims of margarita glasses with lime wedge; dip rims into a shallow dish of coarse sugar and shake off excess. Set aside. In a blender, combine limeade concentrate, orange juice, and grapefruit juice. Cover and blend until smooth. With the blender running, gradually add ice cubes through the hole in the lid, blending until slushy. Pour into margarita glasses. If desired, garnish with lemon or lime slices.